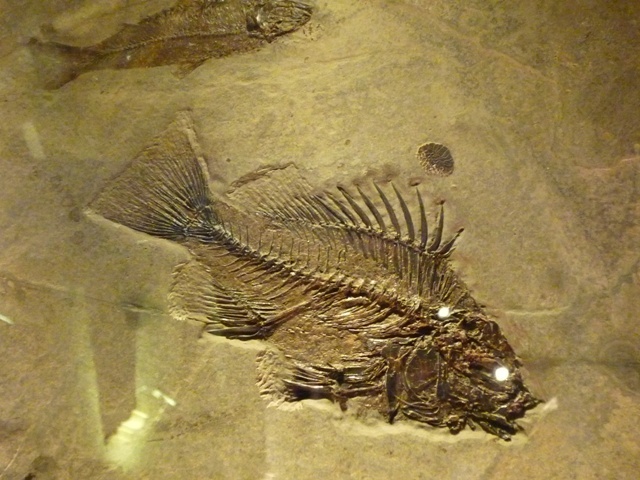 The Australian Fossil and Mineral Museum, in Bathurst NSW, is home to the Somerville Collection. We made the three hour trip from Sydney last week with high expectations, and we certainly weren’t disappointed. The quality of specimens on display was absolutely astounding. As Pete astutely commented, “there was no padding”. Every single piece was magnificent, and the small museum took quite a while to view, because each display was totally captivating. 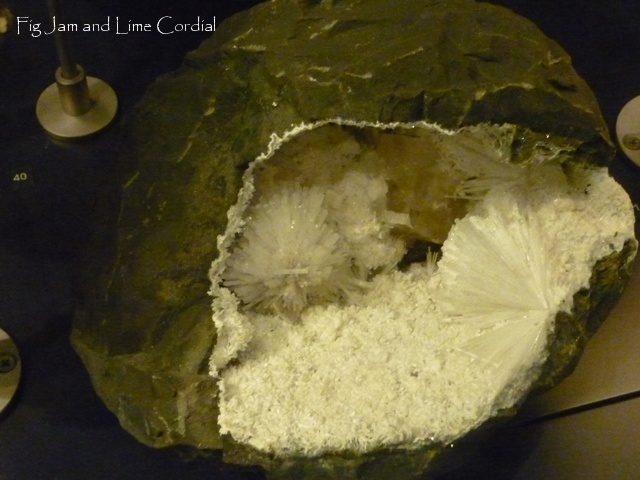 We spent the better part of a morning exploring the two main exhibitions – the Minerals Gallery and the Masterfoods Fossil Gallery. 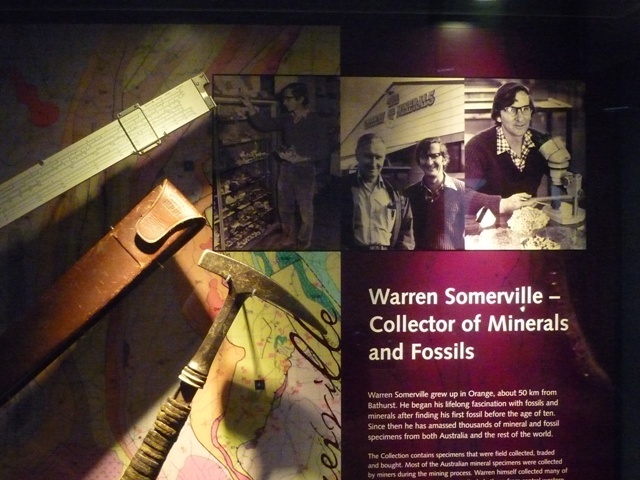 The collection represents the life’s work of Warren Somerville, an extraordinary Australian with an incomparable passion for minerals and fossils. Story has it that when the full sized Tyrannosaurus rex cast (the only complete specimen in Australia) was delivered to his home, his wife decided it was time for either a museum or a divorce. 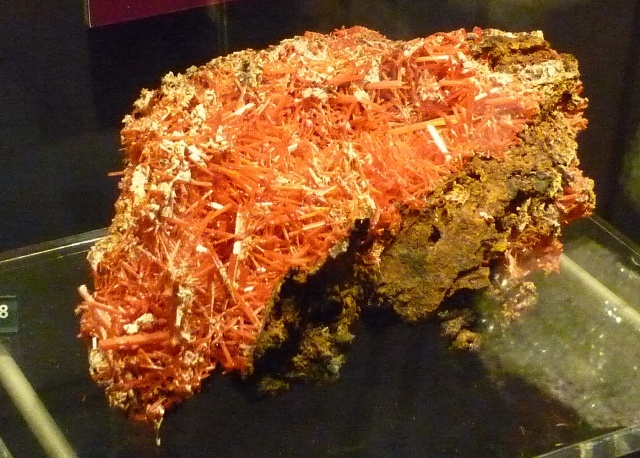 Many of the mineral specimens on display are thefinest examples of their type in the world. I felt like we’d been to the rock equivalent of the Louvre, all for a tiny entry fee of $21 per family. To understand the scale of this collection, it’s worth mentioning that Professor Somerville was offered $15 million to move it to Japan, but chose instead to donate it to a regional museum in New South Wales. Here are the highlights from the ninety-odd photos I took, all handheld, without flash and mostly through glass cabinets – and all taken with my little Lumix camera. Clicking on the items will open up a higher resolution photo. 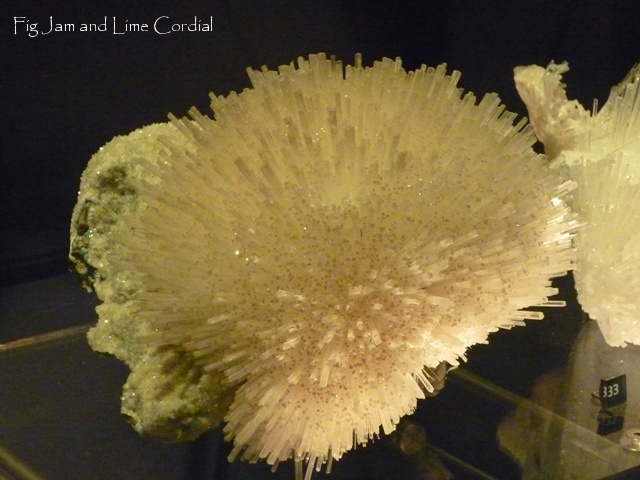 …this magnificent Scolecite, which reminded me of a large sea anemone..
…and several examples of my favourite mineral, Malachite. 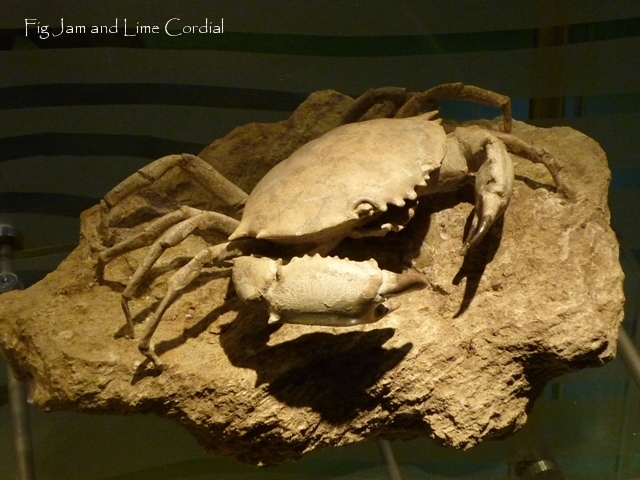 The fossil section of the museum was equally as impressive, and while it was hard to top the T-Rex, this large petrified crab from Monte Bolca in Italy came close. 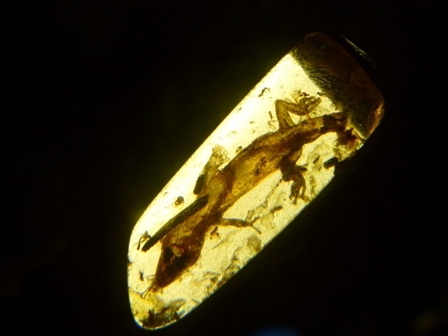 It’s exquisitely detailed – astonishing given that it’s more than 34 million years old. 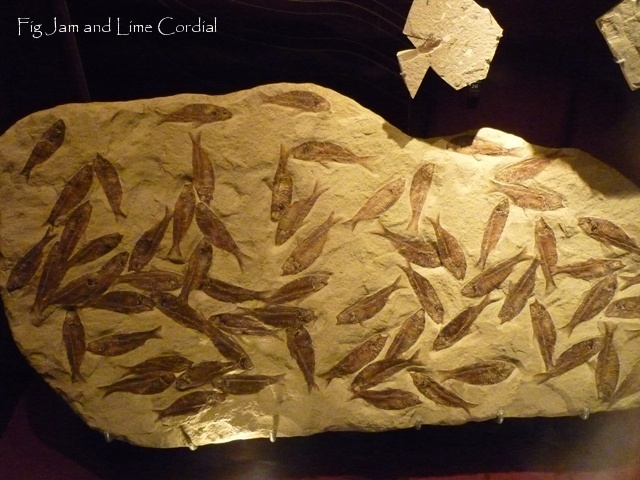 This shoal of herring-like fish were trapped and fossilised 50 million years ago in freshwater lakes in the US. 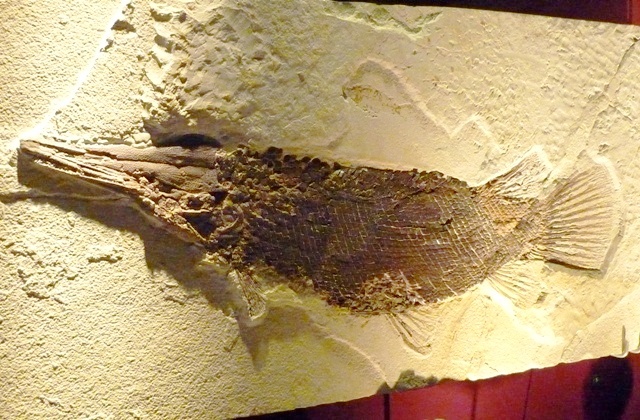 Known as Green River Shale, the rocks from these lakes in Wyoming, Utah and Colorado have unearthed a wide selection of aquatic fossils, including the rare garpike in the bottom photo. 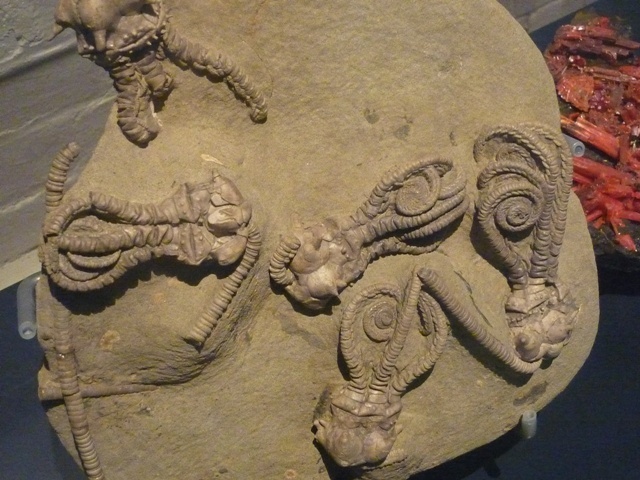 A collection of crinoids from Western Australia – these “sea lilies” were related to starfish and were the most abundant marine creatures 490 – 250 million years ago. Modern varieties still exist today. 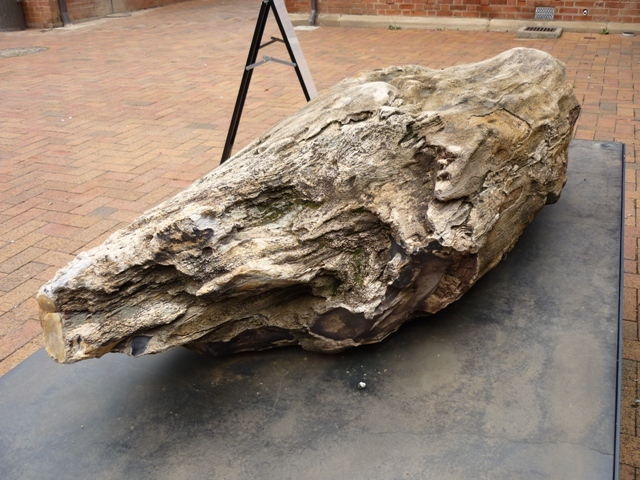 Outside the museum lies the trunk of a petrified gum tree, uncovered in Molong, less than a 100kms west of Bathurst. 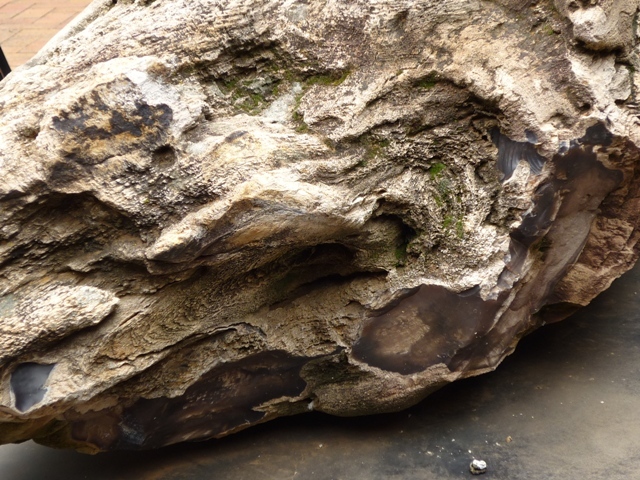 Weighing over a tonne, the organic material in the tree has been replaced with agate over the past 20 million years. 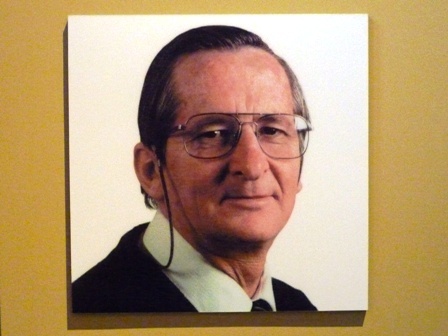 Professor Somerville, thank you for your enormous generosity in sharing these amazing specimens with us. We feel extremely privileged to have had the opportunity to view them, and our lives are all the richer for having visited your museum! I like your blog…….. all of it including the Somerville collection. Blogging is new to me… ie this is it….. I am amazed at how many people have read your blog and commented, but more so at how much great stuff you have put on it. And I like your concept of living on homemade stuff…….. its getting back to the way things were. We have actually been making our own bread for a couple of years now in a bread maker, generally cook pizza dough and sandwich bread …….. interestingly we use “home brand” flour in a 50/50 wholemeal and plain flour recipe and it is good bread?? ?…… the protein levels on the pack are 10g and 9.5g per 100g resp, which I thought was pretty good? I will have to get some fancy flour and give it a go? Perhaps it is the good EVOO I use that makes the difference? Thank you! We’re about to take it one step further and try to create our own fruit and veg garden, so don’t be surprised if you get a call from Pete asking for growing tips! Re the bread – I’m sure it’s the EVOO you’re using that makes the difference! :) But if you wanted to try bread flour or bakers flour (I think Defiance do a line of white bakers flour which they sell in the supermarket in 5kg bags), you might notice your loaves will rise more. Bread flour is usually higher in protein – about 12 – 14%. Looks like a place I should visit if I ever manage to make it to Australia! 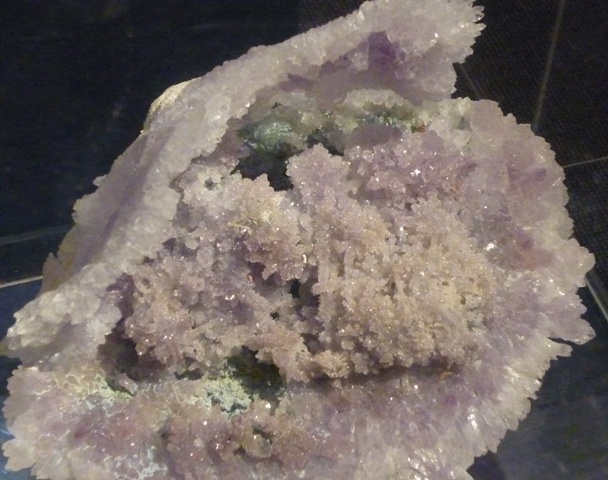 Lovely pics and lovely blog, Celia! How cool is this. Why are you trying to convince me that Oz is the place. I really should send you my husband’s email address, so you can entice him too :-) Love the Amber especially!!!! Very nice, Celia. Thanks for the posting. 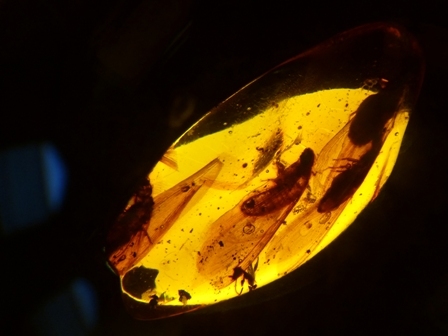 The fossils were truly amazing. Alan and Otto, thanks for stopping by to have a look – I’m so glad you enjoyed the post! 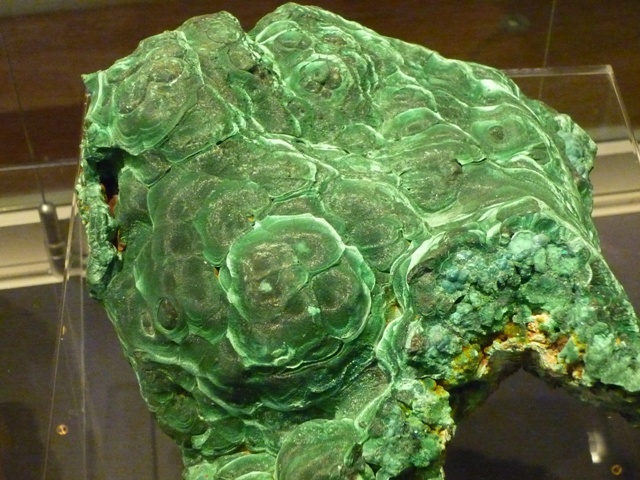 Ozoz, my geologist friend, I was thinking of you as I wrote this! I was so excited by it all, particularly the amber, and even more excited when I came home and saw how well the photos had turned out! 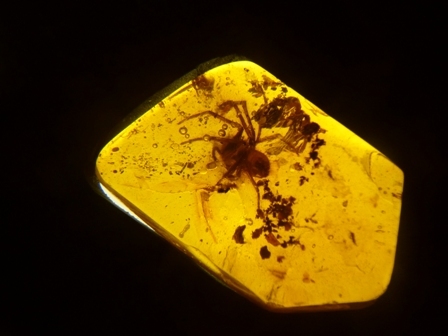 One thing that I found interesting was that you were allowed to use flash throughout the museum (I didn’t, because I’m flash averse at all times), except with the amber display, because apparently the flash can damage the amber. I wonder what it does to it? So what was the food like in Bathurst? Any cafe at the museum? Surely all that fossil looking caused huge hungers? No, we were just passing through! No cafe at the museum either – it’s a tiny place, housed in an old school building and staffed mostly by volunteers! I am a resident of Bathurst & was searching for the ticket prices to the museum when I stumbled upon your post. My wife was incredibly surprised when I started telling her about some of the displays as we approached them, especially as she knew I had never been there before! You did an amazing job of describing the museum with such a great article. Your photos are terrific – the little Lumix really captures beautiful pictures. Very impressed after seeing the real deal. While we were there Warren Somerville himself turned up but we were unable to have a chat with him as the kids were too keen to go look at the T-Rex. btw Dredgemeister – though there is no cafe right at the museum there are quite a few within 500m. Best food in Bathurst is Cobblestone Lane (though it is prob. 12 min stroll from the museum). Damon, thank you so much! I’m always very touched when people take the time to leave a comment, and especially so here, because we were sooo impressed by the Somerville Collection, and I really wanted to convey that in the post. How fantastic that you got to meet the man himself, and that such a wonderful resource is in your home town! I am a resident of Bathurst and was particularly impressed with the high standard of photos you took of the Somerville Collectiion. The collection is not only a national treasure but an international treasure. I would like to ask your permission to add your photos and text to my photos posted at Webshots. At the present time, the Museum is in severe financial difficulties due to lack of proper publicity. Professor Somerville has not been paid his curator’s fees for years and is subsisting on government benefits. Due to a horrible strategic planning move by Bathurst Council, this fantastic tourist and educational attraction is going to waste because of its poor location in a crummy building exterior with a piddling little sign. Other major tourist locations have advertising such as the Big Pineapple, the Big Merino and the Big Prawn. I don’t see why Bathurst did not commission a sculpture for a Big T Rex to be placed up at Mount Panorama for maximum exposure. This is terrible news!! 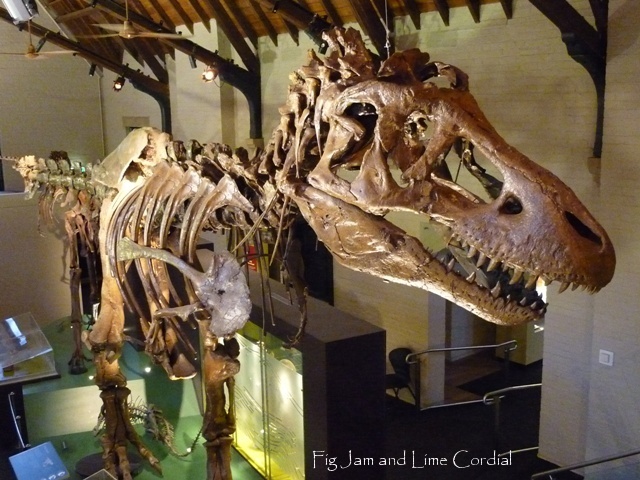 The museum is an amazing resource with some of the finest specimens you’ll see anywhere in the world. Please feel free to use my photos and text (but please credit http://www.figjamandlimecordial.com), and I hope something gets done about this soon – it would be a tragedy to lose such a wonderful place! I have now incorporated your photos and text with my photos of the Somerville Collection and given you full credit. I welcome any suggestions for improvements. I’m very surprised to hear the comments above that Bathurst Council is not fostering/supporting this venture. Warren married my cousin and I was very excited to hear that his wonderful collection had found a home for its full beauty to be displayed. I’ve never actually seen it, though heard a lot about it and still look forward to seeing it in person.